Today I made arduino control 30,000 volts. My arduino has 3 channels of analog output 0 to 5 volt. This generates a lazy 2 Hz sin wave. This tutorial shows how to smooth out PWM using a low pass filter. My low pass filter used 6kΩ resistor and 4.7 µF @ 45V capacitor. This shows the source signal and the voltage doubled signal. Sweet! 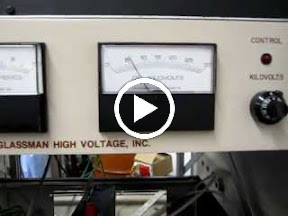 Now we can control the 30,000 volt glassman power supply. The Glassman’s slew rate is really slow without a load.